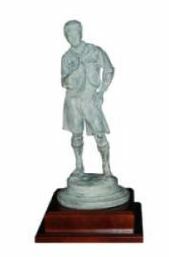 Established by the Boy Scouts of America, the Distinguished Citizen Award recognizes noteworthy and extraordinary leadership of citizens in communities across the United States. Honoring distinguished citizenship delivers a message to our youth that character counts. The lives of distinguished citizens put into place guideposts that serve to inspire our youth to lead, to accept responsibility, and to care about principles and causes beyond self-interest. For over 100 years, the Boy Scouts of America has led the nation in providing citizenship training for American youth. Through the years, Scouting has provided young people with character-development programs based on values found in the Scout Oath: duty to God, duty to country, duty to others, and duty to self. Today’s often heard call for a return to ethical behavior, self-reliance, and caring and concern for others refers precisely to the values expressed in the Scout Law.